I am learning HSMs and I can see a problem that I don’t know how to address. The problem is shown in the image bellow. Inside S1, substates S11 and S12 are continuously changing in reaction to TIMERTICK event. At the same time the superstate S1 needs also to keep track of TIMERTICK event in order to change to S2 after an amount of time. As far as I understand TIMERTICK event will be always processed in one of the substates first so it can’t be used by superstate S1. What is the way to deal with this situation? The timing generator posts two messages TimerTick1 and TimerTick2. The substates react only to TimerTick1, and "burn" the message when they react to it. The superstate reacts only to TimerTick2. The timing generator will always be posting duplicate timing message, because it shouldn't "know" the exact state configuration. The timing generator posts one message TimerTick1. When a substate reacts to the TimerTick1 messages, it "burns" that message, it also post a different message TimerTick2. The superstate reacts only to TimerTick2. This approach somewhat increases the coupling between the substates and their superstate. The substates "know" that that there is a superstate and they have to post a certain message for it. It's a design choice whether or not the substate necessarily burns the message after acting on the message. If you don't burn the message, you can pass it on to the superstate. You will need to watch out that the superstate doesn't spoil the work of each of its substates. In other words, this can increase coupling between substates and their superstate. Here's the purest example of such coupling. As a reaction to a message, a substate determines that the HSM needs to change state to S42. As a reaction to that same message, the superstate determines that the HSM needs to change state to S24. Should substate or superstate win? Were will this be arbitrated? Typically in an HSM, once you're in a state we let its nested machine have at it (process inputs) until there is an input that is not recognized, which is instead bubbled up to the enclosing/parent state to handle. In your case, you would need to not handle all timetick's at the nested level so that some can be handled at the outer level. You might do this by qualifying the events accepted at the nested level, e.g. 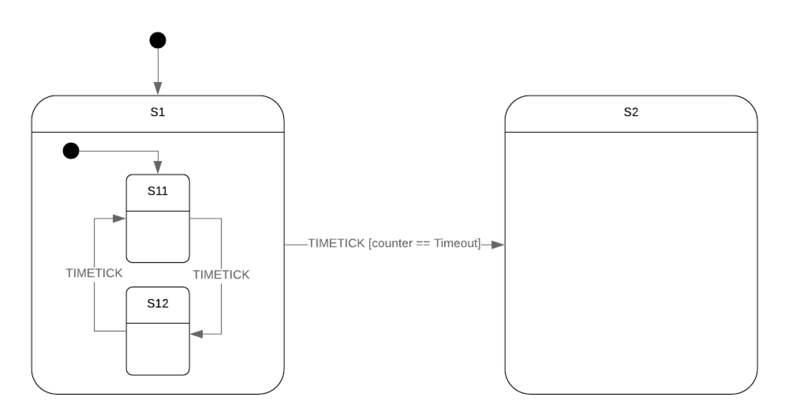 TIMETICK [counter < Timeout]. The (now) unhandled final timetick at the nested level will naturally bubble up to S1 and cause transition to S2.